Forget that our songs are not available on Spotify or why we reformed as a trio. Exactly 10 years after our last gig in the US, we will be back on stage through a series of bar gigs in the Metro that will kick-off at 70s Bistro on September 29. Incidentally, this is also the venue where we last performed with the original line up in Manila before disbanding in 2007. 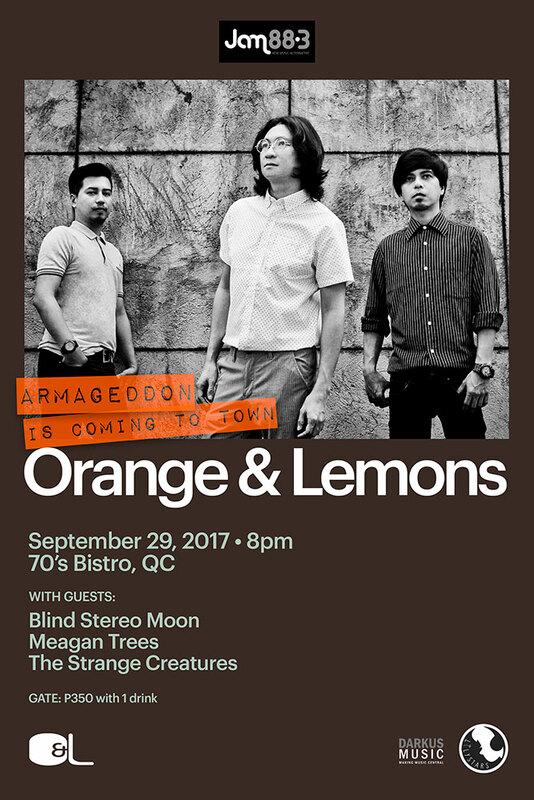 Presented by JAM 88.3 in partnership with Lilystars Records and Darkus Music, “Armageddon Is Coming To Town” will also feature Blind Stereo Moon, Meagan Trees and The Strange Creatures. We look forward to a nostalgic evening with you all! Tagged as 70s bistro, ace del mundo, blind stereo moon, clem castro, darkus music, jam 88.3, jm del mundo, lilystars records, meagan trees, orange & lemons, orange and lemons, the strange creatures.